EDIT 9/6/14 --HEY! THANKS, EVERYONE, FOR PUTTING YOUR NAMES IN THE HAT FOR THIS SHOW! WE'LL BE ANNOUNCING THE FINAL LIST OF ARTISTS EARLY IN THE WEEK! CHECK BACK FOR MORE INFORMATION IN THE NEXT COUPLE DAYS! In the late 80s/ early 90's I had a Powell Peralta. That skateboard was probably the most metal thing I've ever owned in my life. It was an old-school board, nearly as heavy as I was, and twice as thick. I could barely get it off the ground but I loved it to death. I felt like a beast when I held it, covered in bruises and scabs from practicing kickflips. I was never very good, but I still remember coveting my "I wish my boyfriend could skate" shirt, and the excitement of sending Thrasher my envelope drawings, hoping they'd get published in the next issue. In honor of the most metal of months (October, obviously) we're hosting a new exhibition featuring your artwork gracing 7-ply Canadian Maple 'canvases'. Make it dark, make it paranormal, or make it a throwback to the good ol' days when They Live and Return of the Living Dead were our go-to movies for a Friday Night… We're looking for artists that want to join forces for a Halloween exhibition that will make you... flip. The Skate Or Die exhibition launches just as we get our minds set on cooler weather, bonfires and creepy stories near the railroad tracks. Do you have an irrational fear of the man-eating plant from Little Shop of Horrors (Francesca does)? Or maybe a favorite scene from a slasher flick you just can't purge from your brain at night? Sorcery and hexes, superstitions, nature's bizarre and unexplained phenomena, and history's most nefarious circumstances are all fair game. Let's bring your phobias, urban legends and nightmares to life, how you dissect the project is up to you. So put on your "time-to-die" playlist and let's get dark. Lindsay Nohl's Venus Fly-trap Design on a 7ply Canadian Maple deck. We've mastered the art of making professional skate-ready decks with vibrant, detailed graphics and a sturdy finish. 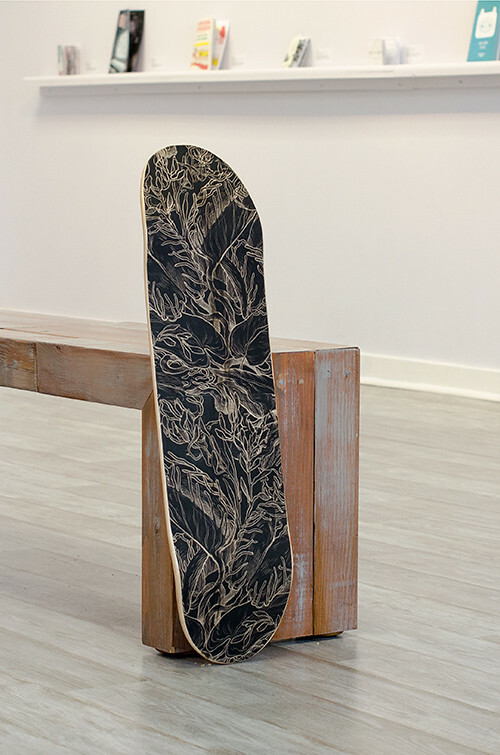 We'll help your work take shape in time for the exhibition by applying your work to professional grade blank decks, worthy of hanging, displaying or skating on. The call for art ends September 5th, and we will be curating the exhibition within the following week and posting the final list of artists on the blog shortly after! The decks will be for sale and the artists will receive $20 for each deck sold. As always, art prints are sold at a 60%/40% split in favor of the artists, and artists may price these prints however they wish! 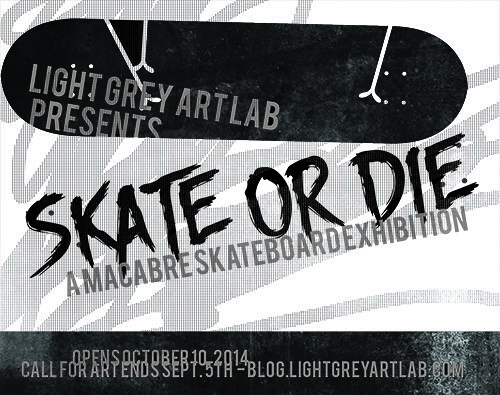 Each deck that is purchased during the exhibition will be hand crafted by the Light Grey team as ordered. We'll be sending out more specifics about the gallery exhibition and details on the show to all participating artists shortly after the closing of the call for art! But! If you have any questions, please feel free to send us a note! SUBMIT YOUR LINKS BELOW BY SEPTEMBER 5th TO BE CONSIDERED!